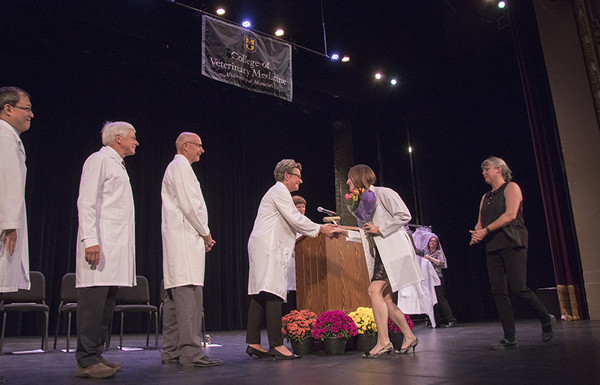 Members of the University of Missouri College of Veterinary Medicine Class of 2019 celebrated the successful completion of two years of study of basic veterinary sciences and their move into clinical rotations during the annual White Coat Ceremony Oct. 15. The transition ceremony was held at the Missouri Theatre in Columbia. 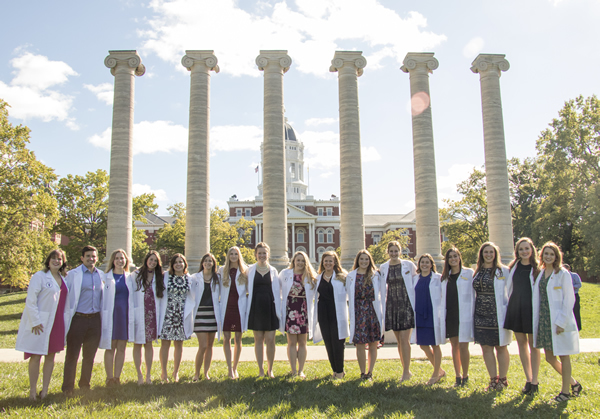 Third-year CVM students gathered for a photo with their friends in front of the MU columns after receiving their white lab coats in a ceremony that celebrates their transition to the clinical portion of their education. The 110 members of the class selected a family member, friend or mentor to present and assist them in donning their laboratory coats. They will next spend 19 months working in the Veterinary Health Center’s Small Animal, Food Animal and Equine hospitals and the Veterinary Medical Diagnostic Laboratory, as well as undertaking preceptorships in private practices or with public agencies on their way to completing their DVM degrees. Associate Dean for Student Affairs Angela Tennison, DVM, who served as the master of ceremonies, noted that the students are closer to the end of their professional curriculum than the beginning. Class of 2019 President Tanner May offered a response on behalf of his peers using a photo of puppies that had cheered the class through times of stress as a backdrop. The first two years of preclinical training provided them with a foundation in biomedical sciences and included courses in anatomy, physiology, cell and molecular biology, pathology, pharmacology, microbiology, virology and toxicology. 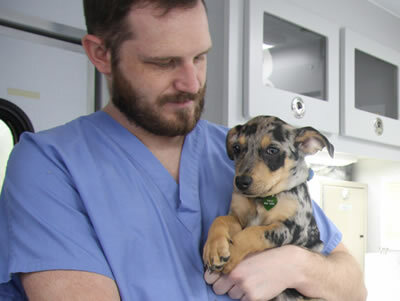 They also learned fundamentals in clinical disciplines that they will need for the rest of their veterinary education including, anesthesiology, clinical pathology, radiology, public health and medicine and surgery. CVM Interim Dean Carolyn Henry, DVM, MS, told the students that while she may not know of the individual obstacles they each faced to reach this milestone in their education, she was aware that they had made sacrifices, and there may have been times when they wanted to throw in the towel. CVM Interim Dean Carolyn Henry congratulates Melissa Siegrist, who selected her mother, Deborah, to present her white coat. John Dodam, DVM, MS, PhD, chairman of Veterinary Medicine and Surgery Department, told the students that as their education moves from classroom to clinics their exams may no longer be multiple choice tests, but instead they would be tested in the middle of the night as they work to save an animal’s life. 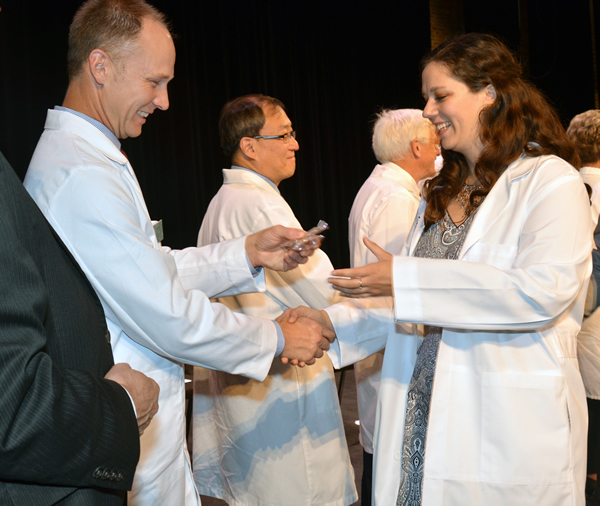 Cliff Miller, DVM, president of the Missouri Veterinary Medical Association, presents a name badge to Jaime Huff during the White Coat Ceremony for the CVM Class of 2019. The Missouri Veterinary Medical Foundation provided each third-year student with a name badge. The MVMA provided each student with a lapel pin for their white coat. Class President Tanner May provided the response on behalf of the class and thanked the professors and clinicians for making time in their busy schedules to help himself and his classmates beyond their normal teaching hours. 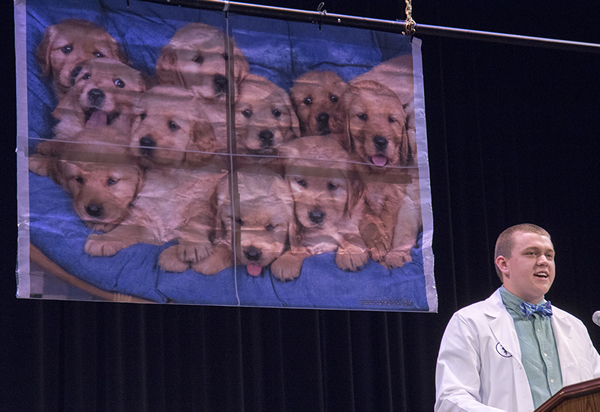 During his remarks, a banner was lowered behind him imprinted with a litter of puppies that students would share on their class Facebook page whenever comment sections began to reflect students’ stress.